Your doll needs not to be bear-footed. Here we'll learn how to draw and shade Mary Jane shoes, which are one of the easiest kinds of shoes to make. 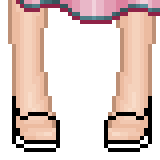 Retrace the line at the bottom of the feet, then draw another line two pixels (or more in the case of platforms) lower to make the sole. 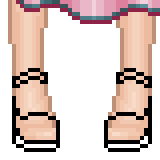 Outline the top part of the shoes. We're making mary-janes because I find they're the easiest type of shoe to outline and shade. 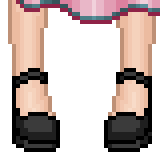 Here the feet are slightly inwards so we see a bit of the sides of the shoes. Now draw the straps, just below where you think the ankles would be. Sometimes this point isn't very clear, such as on this base, so try different heights until it looks best. Now, with the second-darkest colour, shade around the sides and bottom of the shoe, and on the sides of the sole. Since these shoes are quite small, only one shade is really necessary. Highlights are usually lighter in shoes than in other pieces of clothing, because of how shiny leather can be, but limit these to a few pixels at the tip of the foot and in the center of the sole. 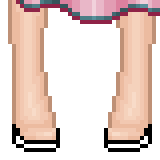 Here's the final pixel doll. The rest of the tutorials in the "For Newbies" series will show how to do the rest of her clothing and hair.